The first exoplanets ever discovered were around a pulsar, PSR B1257+12, back in 1992. One of the most surprising things about this detection was that these planets were around a star that has evolved off the main sequence, raising questions about how planetary systems evolve and how they respond to the evolution of their stars. Since then, there have been other detections of exoplanets around evolved stars, such as the white dwarf WD1145+017 and the pulsar-and-white-dwarf binary PSR B1620-26. An important member of that list over the past few years has been the white dwarf binary system NN Serpentis, which is believed to host two Jupiter-mass planets. Today’s paper is about the detection of a disc of dust around NN Serpentis, which may help us understand more about the system’s history. Firstly, we should talk about NN Serpentis itself. The system contains two stars, a white dwarf and a main sequence star, and it belongs to a class known as post-common envelope binaries. Imagine a system containing two main sequence stars. The stars burn through their core hydrogen, just as our Sun is doing. When the core hydrogen of one star is exhausted, the star begins to grow into a red giant. If the stars are close enough, the swelling outer atmosphere of the evolving star will begin to spill over from the star’s own gravity well into that of its companion. A so-called “common envelope” of gas forms around both stars, creating a drag that causes the two stars to spiral towards each other. After some time the common envelope is ejected, leaving the white dwarf remnant of the evolving star orbiting its main sequence companion on a much tighter orbit than before. Tighter orbits mean shorter periods; in NN Serpentis, for instance, the two stars whiz around each other once every three hours. Some of these binaries, including NN Serpentis, are also eclipsing systems. By measuring the times of these eclipses, astronomers can calculate these systems’ orbital periods very precisely. In many of these binaries, astronomers have found variations in their eclipse times on the order of seconds. There are several effects that can explain these variations, but in NN Serpentis, the most likely explanation seems to be the presence of two Jupiter-sized planets. The existence of these planets brings an interesting question, which is: how old are they? Specifically, were they around before the common envelope phase, or have they formed since? The common envelope phase is a turbulent time for a star system. Pre-existing planets would have to survive large and relatively fast changes in the mass and orbital period of the binary, without being thrown into an unstable orbit. On the other hand, if there were enough material left around the system following the ejection of the common envelope, it might be possible for these planets to have formed out of that debris. Today’s paper adds more information into the mix. The brightness of NN Serpentis was measured in the infrared, using the Son of Isaac instrument and Spitzer, and in the microwave using ALMA. In most of these channels the measurements are consistent with the flux we expect to see from the two stars. In the ALMA measurement, however, NN Serpentis was brighter than expected. An excess of flux at low wavelength generally suggests blackbody emission from some relatively cool material in the system: a circumbinary debris disc. 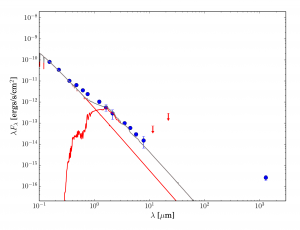 Measured fluxes (blue dots) compared to model spectra (red and black lines). All are reasonably consistent with models except for the ALMA measurement (rightmost blue dot). Source: today’s paper. 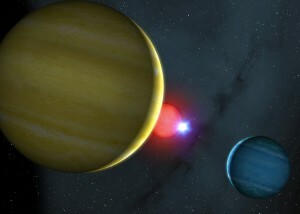 The authors suggest three possible origins for this debris: either the system has always had a dust disc, and the disc survived the common envelope phase; or the debris is the remains of previous planets, destroyed by collisions; or the debris is material left over from the common envelope itself, which was not completely ejected from the system. The authors ran three-body simulations of each model, assuming dust granules don’t interact with each other, only with the two stars, and determined that unejected common envelope material is the most likely source. So, what does this tell us about the rest of the system? It shows that there was debris left in the system following the ejection of the common envelope, from which planets might have evolved. In that sense, the discovery might back the idea that these planets have formed since the common envelope phase. The link is far from definite, however. It is also something that should be borne in mind in future models of the system. A debris disc could have had an impact on the migration of the planets, and the planets in turn could have tidal effects on the disc. Then, there is a possibility that the debris disc might itself be responsible for some of the timing changes in the binary. With only one data point, it’s hard to say for sure. Work on NN Serpentis is still not finished — its eclipses are still being timed for deviations from the two-planet model — but it is clear that there is more to learn from this fascinating system. Exploding diamonds in the sky Timing is Everything: A Pulsar in Orbit One Star, Two Star, Brown Star, Blue Star A Contracting White Dwarf?